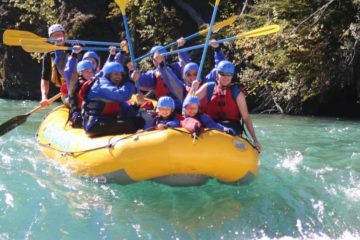 Combo Package; saddle up for a riverside ride, soar up to a mountain summit and soak in mineral hot springs. 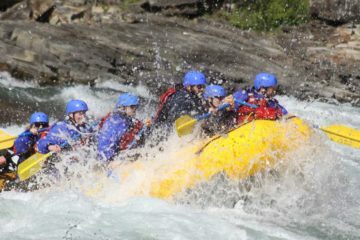 Take a guided horseback ride along the tranquil Bow River and past the historic Cave and Basin, the birthplace of Banff National Park where craggy rock walls surround pools of bubbling thermal water. It’s our most popular horseback ride! Sit back and relax in a four passenger, modern glass enclosed gondola as you ride to the top of Sulphur Mountain in Banff. 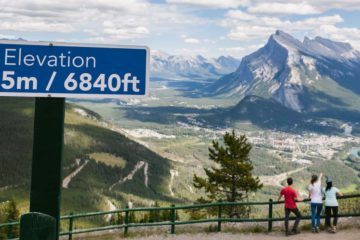 You’ll marvel at the unsurpassed view of Banff, the Bow Valley and a 360 degree view of six scenic mountain ranges from 2,281 metres (7,486 feet) above sea level from the observation deck. Soak in the soothing, thermal hot waters where travelers have come to “take the waters” for more than a century while looking out at iconic jagged peaks of Mt Rundle. This is the highest operating hot springs in Canada! Activities in this package can be taken on the same day or on different days. 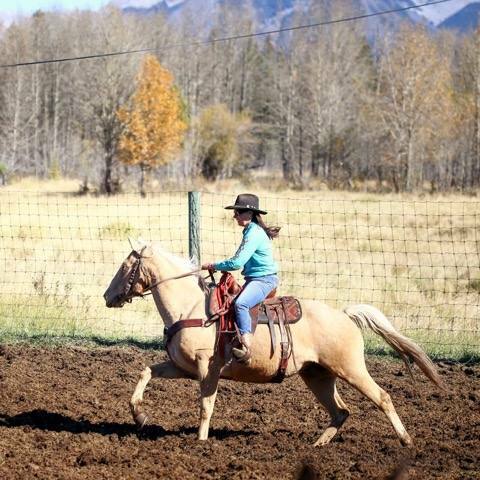 Your horse will guide you along the tranquil Bow River – an area home to wildlife in amongst the thick marshes and grassy meadows, with unspoiled views of the magnificent Rocky Mountains. Pass by the historic Cave and Basin – the birth place of Banff National Park. Here craggy rock walls surround pools of bubbling thermal water. Take an eight-minute journey in a modern, fully enclosed four-passenger gondola cabin over the treetops up to a jaw-dropping mountaintop experience at 2,281 metres (7,486 feet). The state-of-the-art summit facility has restaurants, interactive interpretive exhibits, a multi-sensory theatre and a breathtaking 360-degree rooftop observation deck. Soak in the steamy hot mineral water at 1,585 meters of elevation (5,200 feet). The Banff Upper Hot Springs has all the amenities of a modern facility in a splendid historic spa and bath house – set against a backdrop of Banff National Park’s spectacular alpine scenery. How long is the Bow River Horseback Ride? The tour is a one hour horseback ride. Please arrive 30 minutes prior to your tour start time. What does the Bow River Horseback Ride include? The tour is a one-hour horseback ride along the Bow River and past the historic Cave and Basin site. You will be provided with a brief riding instruction, a helmet, a friendly horse, and lead and tail guides riding at each end of the small group. 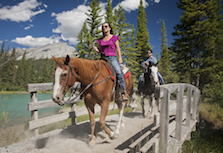 Where is the meeting point for the Bow River Horseback Ride? 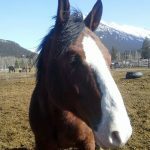 When should I arrive for the Bow River Horseback Ride? Please ensure that you arrive 30 minutes before the ride is scheduled to depart. What should I wear for the Bow River Horseback Ride? You must wear sturdy, closed toed shoes and long pants are best for riding. Please note that sandals of any kind are not permitted. Helmets are provided and are mandatory for all riders and mosquito repellent is highly recommended. Is riding experience required for the Bow River Horseback Ride? 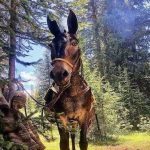 Can I bring a backpack on the Bow River Horseback Ride? Guests cannot bring a backpack on the horse. 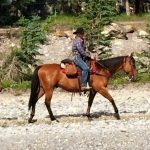 What is the cancellation policy for the Bow River Horseback Ride? 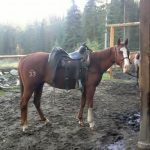 Should I tip my guide for the Bow River Horseback Ride? Where is the meeting point for the Banff Gondola? The Gondola Station is located at the end of Mountain Avenue in Banff, about a five minute drive from downtown. Detailed driving directions will be included with your booking confirmation. Alternatively a free shuttle bus runs in the summer from downtown Banff, or guests can catch the Roam Transit bus or a taxi. When should I arrive for the Banff Gondola? Plan on arriving 20 minutes prior to your departure time, and please ensure you are in line 10 minutes prior to your departure. How long is the Banff Gondola ride? The gondola ride is approximately eight minutes each way. The suggested total visit time is 1.5 – 2 hours. What's at the top of the Banff Gondola? Step out into a jaw-dropping mountaintop experience at an elevation of 2,281 metres (7,486 feet) and stroll along the ridgetop boardwalk where the views get better with every step. Then warm up in the newly transformed, state-of-the-art summit facility with new restaurants, interactive interpretive exhibits, a multi-sensory theatre and a breathtaking 360-degree rooftop observation deck. Several scenic hiking trails lead away from the summit complex. One of the most popular is the self-guided interpretive Sulphur Mountain Boardwalk to Sanson’s Peak on which you can follow in the footsteps of Norman Sanson, who walked to the top of the mountain about every week for 30 years to check the weather. How many people fit in a gondola cabin? The modern, fully-enclosed gondola cabins each comfortably fit four adults. A young child or baby may be possible to make five. Will I see any wildlife on the Banff Gondola? You may encounter some of the local wildlife including Rocky Mountain bighorn sheep, golden mantled ground squirrels, hoary marmots, Clark’s nutcracker and the Canada (Gray) jay. When is the last ride up the gondola? The last ride up the gondola is one hour prior to close, and last ride down is 30 minutes prior to close. Operating hours vary throughout the year. What is the cancellation policy for the Banff Gondola? Gondola tickets are non refundable after purchase. If you would like to change your upload time once purchased, please phone the number on your ticket. Where is the Banff Upper Hot Springs? The Banff Upper Hot Springs are located on Sulphur Mountain, near the Banff Gondola, just a 5 minute drive from downtown Banff. There is limited parking onsite, or guests can take ROAM, Banff’s regional bus service. When can I visit the Banff Upper Hot Springs? The Banff Upper Hot Springs are open from 9:00 a.m. to 11:00 p.m. daily, and you can present your ticket for any day and time. What amenities are there at the hot springs? The Banff Upper Hot Springs features a hot soaking pool (39 °C) with a spectacular view of Rundle Mountain, change rooms with one-time use lockers, a gift shop and a cafe. Towels and swimsuits available for rent. What is the cancellation policy for the hot springs? Please note that tickets are open dated and non-refundable. Guests participating in horseback riding will need to be 8 years or over and a maximum of 250lbs. For safety purposes helmets are mandatory to be worn by all riders. Reservations are required to guarantee your timeslot for the Banff Gondola. Please show the bar-code voucher for entry, for the specified time reserved.